After much deliberation (because let’s face it, as artists, we can be a little indecisive), we’re ready to announce the 2016 theme for Artists in the 5th: In-school arts programming for grades 4-6. Every year, we work in collaboration with artists to decide on a theme that will be the jumping off point for the program. All of the projects created through the program will be presented on stage at our community celebration at the Thunder Bay Community Auditorium on Wednesday February 24th, 2016. Thanks to all of the folks who took a moment to vote on the posted themes. We’ve taken one of the top themes, and added a little twist to it. Water has been on our minds lately. From travelling with the Train of Thought, where we spent time with artists and wisdom-keepers who were collecting and honouring water across the country, to having many conversations about caring for water with community members, artists, and just yesterday, the Lieutenant Governor of Ontario, Honourable Elizabeth Dowdeswell. And…we live on the shore of the largest freshwater lake (in area) in the world, Lake Superior. The deep waters of the Lake hold stories, life, and so much importance in our community. From water we learn respect, strength, calmness, how to keep moving and how to stay still, survival, transformation, and how to make and adapt to change. It can make us feel so big and so very small. Water is our future. Keep moving. Make ripples. Spark change. 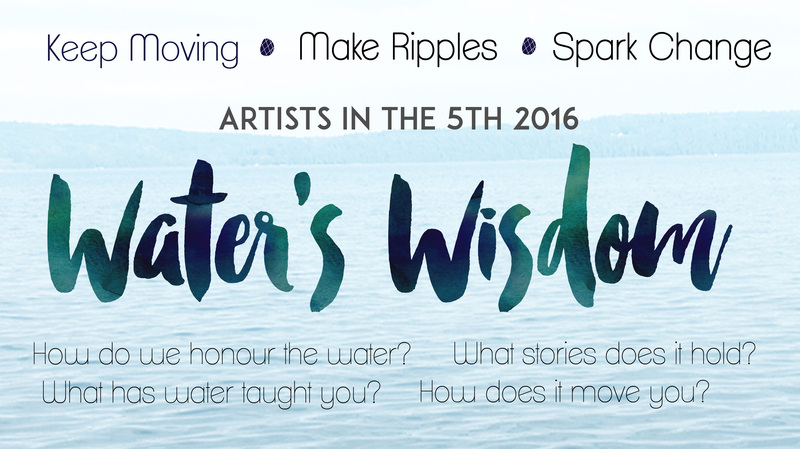 What has water taught you? If this theme excites you as a local artist, there’s still time to join our roster. We’ve extended our submission deadline to September 3rd. Fill out our online form to be considered for the program, or get in touch with us to make an oral application to the program. So looking forward to seeing the dance, drama, craft, literary art, music, new media, and visual art (whew!) collaborations that take place between local artists, educators, and students across the City.